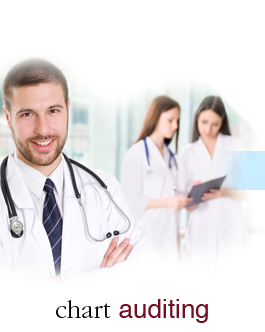 As one of the nation's top medical billing companies, Physicians 1st provides medical billing as well as fully up-to-date Chart auditing for all specialties. Chart Auditing is one of the most important tasks for a successful medical office operation. New attention from the OIG (Office Of Inspector General), RAC (Recovery Audit Contractors and other third party auditors make this service a necessary and integral part of your business. Your practice will be audited. We believe that taking a proactive approach will provide you the with the knowledge to be comfortable when the auditors come. A surprising number of clients do not realize that under-coding is also considered fraud, and a significant loss of revenue. Choosing a proper code is always performed on an individual basis. CertifiedACS-EM. Advanced Coding Specialist for Evaluation and Management. Although Physicians1st is routinely called upon by the medical community to review charts AFTER the auditor has arrived it is better to be proactive. Audits are performed in our office, reporting is done, and education is then performed with clinical and clerical staff. If the audit falls below the OIG threshold of 95 percent, monitoring on a quarterly basis is recommended. With Physicians 1st as your Medical Coding Auditor as well as your outsource billing department, you have complete assurance that all your medical billing coding and procedures are accurate from the point of input through the auditing phase. Accuracy means a better stream of revenue to your practice and a worry-free solution to potential billing discrepancies.